Today 23-February-2017, is India’s Stock Markets Exchange Derivatives – Futures and Options expiry day for derivatives for the month of Feb 17 not other months. Which means all options and futures contract for this month Feb 17 will expire today at 3.30 pm. Out of The Money (OTM) options will expire worthless and In The Money (ITM) options will have only the intrinsic values left in the premium at around 3.25 pm. Therefore you must close all options for Feb 17 contracts before 3.25 pm (5 minutes before market closing to avoid leaving it open by mistake), if possible, especially In The Money (ITM) options. Please read carefully to know the reason. In short it is dangerous to leave it not closed. Old subscribers may remember that I have keep saying in my blog since last two years, do not let your options expire worthless, there can be a penalty by the exchanges. Now there is even more and severe danger of letting them expire exercised (not worthless). The Securities Transaction Tax (STT) tax on options that do not expire worthless but get exercised face a huge Securities Transaction Tax (STT) of 0.125% on the Total Value Of the Options. What is an Exercised Option? An option is considered exercised if it was bought any day before expiry, is In The Money (ITM) and not sold before the expiry day of the that expiry month options only. An option is considered worthless if it was sold any day before expiry, is Out of The Money (OTM) and not bought back before the expiry day of the that expiry month option only. To avert chances of any penalty or to avert risk of STT (no one knows all the rules of STT), it is better to close all derivatives, options or futures, In The Money (ITM) or Out Of The Money (OTM), before the expiry day. Though some of my options too expired worthless in Jan 2017 too, but luckily they were all sold not bought and they were Out of The Money (OTM). There was no brokerage and no STT levied on my options since they expired worthless and were sold not bought back. But even if there was no STT done on sold options that expired worthless, I still recommend close all derivatives before expiry day. Now we just do not know what may happen. If your brokerages are too high you can register with a low cost brokerage firm which costs next to nothing to close options and futures. It is better to pay a small fee rather take the risk of letting options expire in the money or out of the money, exercised or worthless. Contact me to help you open an account with the lowest and one of the best brokerage form in India. Please note that only February 17 month options will expire today, not any other months options. So, this rules applies today to February 17 month options only. Today is options and futures expiry day of February 17 month options and futures contacts only, rest of the remaining months options and futures will not expire today. Small Note: My Conservative Options and Futures course is designed in such a way that we do not wait till expiry day to avert these kinds of dangers. They are very conservative in nature and have risk management inbuilt due to hedge. This is the reason a lot of traders are doing pretty well trading my strategies since 2014. Contact me to know more about it. In the case of options trading and closed when the markets are opened anytime before the expiry day, the Securities Transaction Tax (STT) is 0.05% on the premium. This is ok and it makes sense and is easily affordable. But here is the problem and a BIG one. What About Securities Transaction Tax (STT) on Options That Are Not Closed Before Expiry Day? The Securities Transaction Tax (STT) on exercising an option is 0.125% on the total value of the options bought. Exercising of the option is that you bought an option (it does not matter when you bought – 60 days, 50 days, 40 days, 30 days, 20 days, 10 days or on the expiry day for Intraday day trading), but are not willing to close the trade to save brokerages and taxes, or have forgotten to close it and leave it till expiry day’s markets close – after which you cannot trade them. This is where the problem lies. When an option is exercised, the Securities Transaction Tax (STT) is paid on the entire value of the option and not just the total profits made. For example let’s say Trader “A” forgot to sell his option on expiry day. Nifty closed at 8872.55. 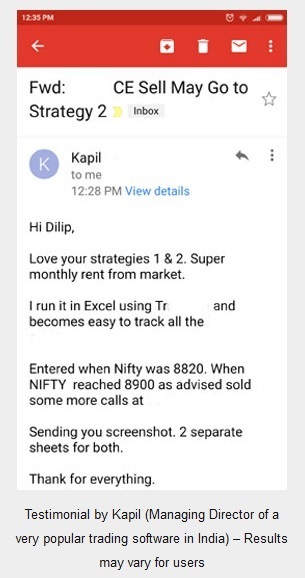 It does not matter what the premium was of the options he bought when Nifty closed. 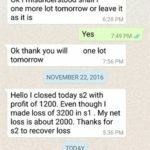 Suppose Trader “A” made a profit or loss of Rs.1 lakh. Again it does not matter what the profit or loss was made on an exercised option. Why profit or loss does not matter here you will know soon. The Securities Transaction Tax (STT) will be Not be levied on Rs.1 lakh profit or loss. It will be levied on total value of the In The Money (ITM) options. Supposing the above trader bought 1000 lots of Nifty options and forgot to sell it and it got exercised. Nifty on that day closed at 8872.55. 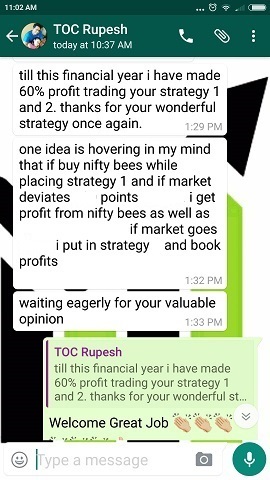 Since Trader “A” allowed the Nifty options to be exercised, he has to pay STT on the full value of the options bought. 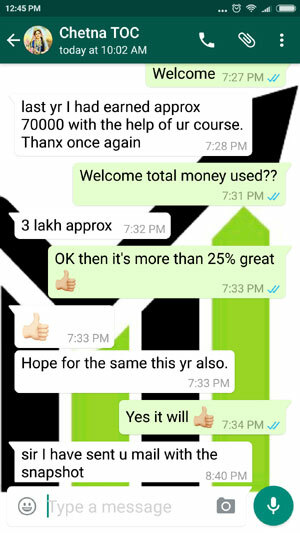 This in spite of making a profit if Rs.100,000.00 on the options he bought. Or even after making a profit of Rs.1 lakh, Trader “A” will be in a huge loss of Rs. 7 Lakhs 31 Thousand and 801.56. Do not let such a situation ever come in your entire life of trading. 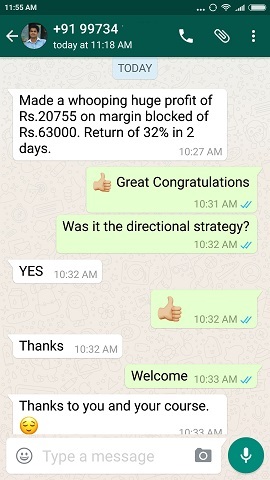 A real trader Mumbai-based Chirag Gupta, is currently facing a loss of Rs.18 Lakhs even after making a profit of Rs.6.07 lakh on the options he bought but did not close on the expiry day of January 2017. He bought options for 0.05 but did not close for reasons known to him. I cannot say why he did not close as he has not said it anywhere, so I do not know. A Note to Mr. Chirag Gupta: If you are reading this let me tell you that I am extremely sad with what happened to you. I am sure my readers must be also be very sad after knowing your story. Please let us know in the comments section why you did not close the options you bought before markets closed on that fateful day? It will help us tremendously to avert such a situation. Sorry Mr. Chirag Gupta, but lets hope for the best. His article is published in Economictimes as well. Close all Futures & Options on or before its expiry day to save huge Securities Transaction Tax (STT). Sir, Goodevening, Today’s article about closing of options before expiry is really useful for so many individual traders like me as really I never hear about such huge (STT) Tax.. So glad to you Sir. vital aspect of money management,risk reward revealed. 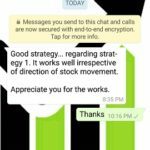 Thank you Sir.you mean to close the sold or bought options if it is in the money. In case if it is out of the money, I think no STT, so no risk? Yes if it is OTM (Out of Money) and you forgot to close there is no risk as it expires worthless. Thanks for the detailed explanation on STT trap. I am talking only about exercised options which attract very huge STT (very very very …… huge!). 1) I don’t understand how this taxation (on whole option value) came and still around for couple of years irrespective of people have been falling into this trap. How come someone may need to pay Rs.25 Lakh just for an investment of Rs 1 Lakh?!!!. At max what he could afford as tax may be whole of his investment. In any case tax can not be more than investment!!! c) What if some one buys huge options (say index options and spouse does not know about this) and dies. If these options fall into ITM with less profit, then his account will be bankrupted? What about his family then? 3) Is there any guarantee that I am able to exercise all my options before 3:30 pm. Say I bought huge index options at last hour of expiry. If my options are ITM during last 15 mins, is there any guarantee that i will be able to exercise these all near the end? Or it is always possible that there will be not enough buyers and I will be left with ITM options at the end (even if I tried to exercise)??? Actually after reading this news even I was shocked. But what can we do tell me? We are not people creating laws, we have to live by the laws. Beggars cant be choosers – you know that. Even before this event happened I have written many times over in my site and in my newsletters that close all your options on the expiry day by 3.15 pm – 15 minutes before close bell rings. Franky to tell you the truth, I also had no idea of this law until I read about it. Still as I am very risk averse trader I make sure to leave no stone un-turned till expiry day. I close much before just to avoid risk. How much can you save on brokerage at least not lakhs of rupees. Yes your other points are valid. What if one forgets or meets with an injury, no internet connection etc. Actually no answer – there is no law for that. To help their clients save money brokers should not allow this. What happened was unfortunate, but laws still exist. Nether you nor I can do anything about it. So please close all options by 3.15 pm on expiry day – there is no other option. Why try to figure out good or bad law – we have no choice but to follow them. Aren’t options settled at Rs. 0 after the expiry, if we look at NSE historical data? 0.5 – they do not go to ZERO. You may leave them to expire worthless to save brokerage. Only Out Of Money Options expire worthless. In The Money Do Not expire worthless that have intrinsic value left.